The Calix Society of Central Arkansas is a unit of the national Calix Society, which is a Catholic organization that helps alcoholics and their families recover and heal. To learn more visit, the diocesan Alcohol and Drug Ministry. For meeting times, see the calendar at the top left of this page or search for this event in our Calendar of Events. The Knights of Columbus is a worldwide Catholic men's organization focusing on charity, unity, fraternity and patriotism. To learn more, visit the website for Knights of Columbus. The motto for the Ladies of Charity is “to serve rather than be served in humility, simplicity and charity." 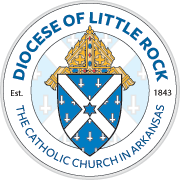 The mission of the local association is to improve the lives of the poor and disadvantaged in the state of Arkansas through education, empowerment and evangelization. Local projects reflect the spirit of St. Vincent de Paul by addressing both the corporal and spiritual needs of those being served. To learn more, visit the website for Ladies of Charity of Arkansas. The Society of St. Vincent de Paul is a Catholic lay organization that provides emergency assistance for local individuals and families in need. To learn more, visi the website for Society of St. Vincent de Paul in Arkansas. The St. Dymphna Society is a Catholic support group for people suffering from mental illness. The goal of the organization is to provide support and help participants realize their value and understand that they are genuinely welcome. For meeting times, see the calendar at the top left of this page or search for this event in our Calendar of Events.